Well after a well deserved summer break, it is time to start again our journey to visiting as many football stadiums as possible. This time our journey takes us to Real Madrid, #1 football club in the world. Why Real Madrid some of you may ask. Simple, I am on a well deserved holiday in Malaga, South Spain, and agreed with my wife to do the 500km journey to Madrid to visit the famous Santiago Bernabeu. She is a Saint or can’t be bothered talking memoit of it. Founded in 1902 as Madrid Football Club, the team has traditionally worn a white home kit since inception. The word Real is Spanish for Royal and was bestowed to the club by King Alfonso XIII in 1920 together with the royal crown in the emblem. The team has played its home matches in the 85,454-capacity Santiago Bernabéu Stadium in downtown Madrid since 1947. Unlike most European sporting entities, Real Madrid’s members (socios) have owned and operated the club throughout its history. In domestic football, the club has won a record 32 La Liga titles, 19 Copa del Rey, nine Supercopa de España, a Copa Eva Duarte, and a Copa de la Liga. In international football, the club has won a record 11 European Cup/UEFA Champions League titles, a joint record three Intercontinental Cups, two UEFA Cups, three UEFA Super Cups and a FIFA Club World Cup. The Santiago Bernabeu stadium is located in the district of Chamartín of Madrid. It occupies the block bounded by the Paseo de la Castellana and the streets of Concha Espina, Padre Damián, and Rafael Salgado. Nearest subway station is Santiago Bernabéu on the Line 10. On 22 June 1944, the Banco Mercantil e Industrial bank granted a credit to Santiago Bernabéu and Rafael Salgado for the purchase of the land adjacent to the old Ramin Amin. On 5 September 1944, architects Manuel Muñoz Monasterio and Luis Alemany Soler were hired and the structure on the site began to give way to the new stadium. On 27 October 1944, construction work on the stadium began. The Nuevo Estadio Chamartín (English: New Chamartín Stadium) was inaugurated on 14 December 1947 with a match between Real Madrid and the Portuguese side Os Belenenses, which resulted in a 3–1 victory for Los Blancos. The stadium had an initial capacity of 75,145 spectators, 27,645 of which had seats (7,125 covered) and 47,500 for standing fans. Sabino Barinaga was the first player to score in the new stadium. The first major renovation occurred in 1955. On 19 June of that year, the stadium expanded to accommodate 125,000 spectators. Thus, the Madrid coliseum became the biggest stadium of all the participants of the newly established European Cup. On 4 January 1955, after the General Assembly of Members Compromisaros, it was decided that the stadium adopt its present name in honour of club President Santiago Bernabéu. In May 1957, Real Madrid used electric stadium lighting in a game against Sport Recife of Brazil. Following a series of spectator fatalities in the 1980’s (most notably the Heysel Stadium in Belgium and the Hillsborough Stadium in England), English authorities released the Taylor Report on how to improve football spectator safety in English venues. UEFA followed suit across Europe. The stadium was forced to create separate shortcuts to different stadium sections and seats for all spectators. In the 1990s, the Santiago Bernabéu went through a large expansion and remodeling. The board of Ramón Mendoza awarded the project to Gines Navarro Construcciones, S.A.
As a club representing the rich and the powerful of Spain, Real Madrid has a very demanding clientele. When Florentino Pérez became the president of the club, he launched a “master plan” with one goal: to improve the comfort of the Santiago Bernabéu and the quality of its facilities, and maximise revenue for the stadium. Pérez invested €127 million in five years (2001–2006) by adding an expansion to the east side of the stadium, as well adding a new façade on Father Damien street, new costumes, new boxes and VIP areas, a new stage in honour of the east side, a new press area (also located on the east side), a new audio system, new bars, integration of heating in the stands, panoramic lifts, new restaurants, escalators in the tower access, and implementation of the multipurpose building in Father Damien street. Well on a sunny Tuesday morning off we went and got the metro, line 10, that took us directly to Santiago Bernabeu. I must say that I was unsure how my son would behave as he is in the middle of his terrible twos. As you arrive in front of the Bernabeu, you must make your way towards gate 7, tower B, which is on the left handside when facing the stadium. There you can buy your tickets. You should know that the basic stadium tour is self guided. In this respect, it is very much the same concept than Arsenal. However, you can get a guide, but it will cost you an extortionate 170 € to do so. Once this is done you go to tower C and go through two checks of airport style security. This time I did not take the pram but you can do so. However, if there are some lifts, it is not completely pram friendly so be prepared to do some lifting. We got to the top of the stadium and there we had an amazing view. If from the outside it looks old and kind of ugly (looks like a block of concrete), inside it is an ansolute gem. Quite similar to Old Trafford. Unlike many European stadiums, you are quite close to the pitch and you have a good view right at the top. Time to take few pictures and we make our way towards the museum. You have some amazing pieces of history and shed lots of videos on huge screens (10m long! ), I want the same at home :). You get to see all 10 Champions League trophies. Wait a minute have they not won there 11th “La Undecima” this year against local rivals Athletico Madrid? Of course but they keep it for the end where you get to take a picture with it for 11 € small format or double for big format. I must say that it is a must to have your pocture taken with the “Big Ears” cup for any football fan. I can now say that I got to touch the original Champions League Cup (also great money maker). You then get to mid tier level and it is the first time you can access the stands. At that point the sun is shinning nicely and you can enjoy a panoramic view (see picture at the top). You also can eat a bite and drink in the concourse, which is always handy to keep a 2 years old happy. The pitch is immacualte and younhave those UV lights on where there is no sun. Unfortunately, no guide to tell me how much it cost but can only be in the range of £1m to £5m. You then make your way to pitch level. I must say that it is impressive. You feel really close to the pitch. I can imagine how much pressure the players are under when the crowd is turning on them. Having played at Old Trafford, I should add Santiago Bernabeu to my bucket list. We make our way to the bench. Well you call it bench, I call it 5 stars luxury seats. The issue of having a self guided tour is that there is no regulation of the flow of people and therefore you have a real bottle neck in key areas, such as pitch side. However, I managed to get my son squeezed in one of the seats and take a picture. I told him not to get too comfy as his place should be on the pitch. We did not stay too long there for obvious reasons and made our way down the small tunnel that the players take (10 steps down from the pitch). Same principle than Anfield for those who have been there. We make our way up to the home dressing room (alongside the metal fence that seperates the home and visitors players in the tunnel that again you can see on tv). Shame there is no guide as I would have loved to know why they decided to put such a fence (what event caused that to happen – a feisty el clasico?). 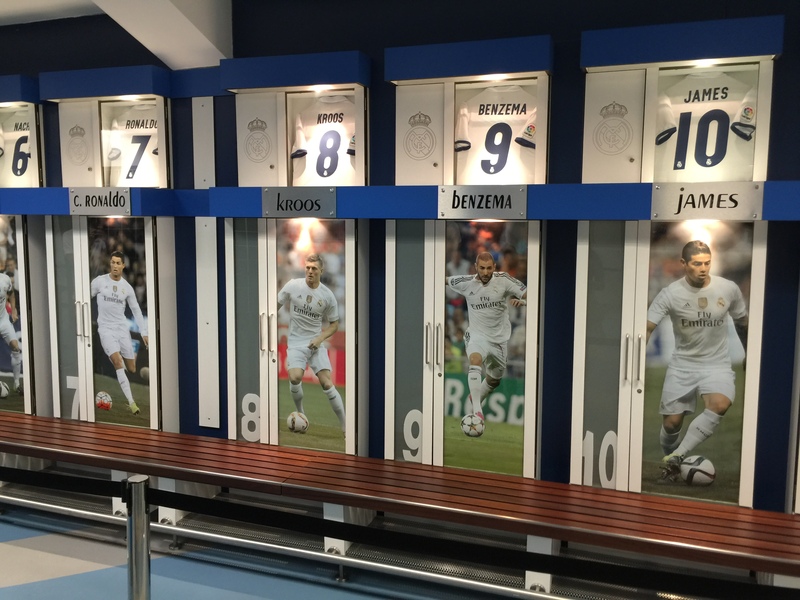 Each locker is personalised. It is quite a confined area with two indoor bicycles, showers, pool, and 1 toilet (can’t be having more than one player with a stomach bug, unless you do like Robbie Savage and use the ref’s one). The final part of the tour is the press room. Way bigger than Villa but much smaller than Man City. There you can take your picture and the desks are basic wooden tables (they did retain a bit of the working class football essence!). This concluded an excellent day out and one I would strongly recommend to do. The future relationship between the UK and EU – what to make of it? Is a Second Brexit referendum legitimate?